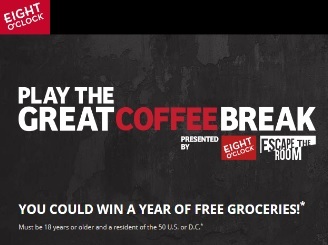 The new The Great Coffee Break a digital escape room game offers a fun augmented reality-triggered experience plus a chance to win a year of free groceries (enter by August 11, 2018)! Check out Extra’s segment where Mario Lopez and AJ Calloway try out the game. Players of the Great Coffee Break can explore different virtual rooms within the roastery to find clues, solve puzzles, and complete the mission. Eight O’Clock Coffee’s game is designed to facilitate the satisfying feeling of discovery that players experience in physical escape rooms, which have grown in the U.S. from 22 in 2014 to about 2,300 today. These adventure escape room location, inspired by “escape room” video games, are set in a variety of themed, fictional locations (prison cells, space stations, etc.) where participants solve various puzzles and riddles to, of course, get out of the room and complete objectives usually under a set time limit. This entry was posted in 1Life and tagged coffee, contest, Eight O' Clock Coffee, escape the room, Games, Great Coffee Break, media, Michael Siebenaler, Mike Siebenaler, Tall Writer. Bookmark the permalink.